The Department of Transportation revealed plans for New York City’s first-ever physically-separated bike lane, or "cycle track," at a Manhattan Community Board 4 meeting last night. 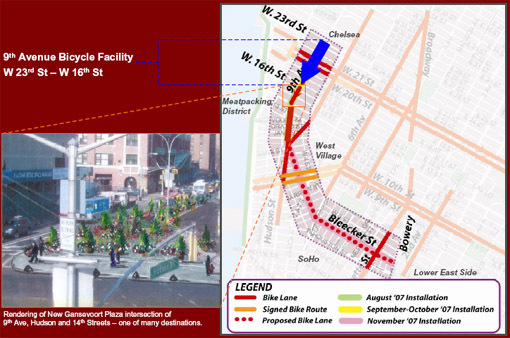 The new bike path will run southbound on Ninth Avenue from W. 23rd to W. 16th Street in Manhattan. Unlike the typical Class II on-street bike lane in which cyclists mix with motor vehicle traffic, this new design will create an exclusive path for bicycles between the sidewalk and parked cars. turning left." Likewise, left-turning drivers’ view of cyclists will be completely unobscured. The bike lane is 10-feet wide to accommodate street cleaning and emergency vehicles. DOT planners consulted with Danish urban designer Jan Gehl on the plan, according to Transportation Alternatives Deputy Director Noah Budnick. "They are drawing from international best-practice and being smart about talking to other engineers and planners who have implemented these types of designs," Budnick said. "They really thought holistically about everything that is going on on the street." These types of physically-separated on-street bike lanes, increasingly referred to as "cycle tracks," are commonly found in bike-friendly cities like Copenhagen and Amsterdam. Livable Streets advocates have long pushed DOT to experiment with this type of bike lane design in New York City. 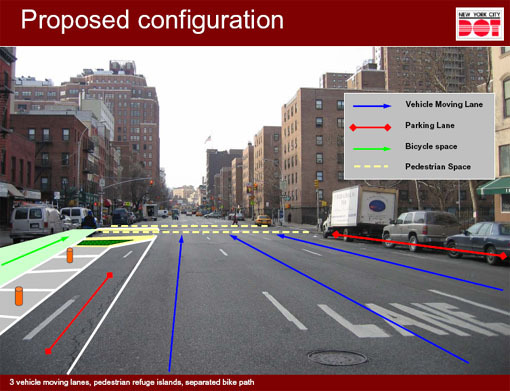 After Benson’s presentation, Community Board 4’s transportation committee voted to approve the DOT plan which is part of a larger pedestrian safety and public space initiative around the intersection of 9th Avenue and 14th Street. The new bike lane design is a break from previously stated DOT policy. officials told Manhattan’s Community 2 that physically-separated bike lanes should only be installed on streets with a maximum of 8 intersections per mile to ensure fewer conflicts with turning vehicles. A copy of the presentation DOT made at last night’s Community Board meeting can be found here. Why do we spend millions of taxpayer $$$ on this nonsense. In a few years time, the municipal leaders (yeah, right) will be removing these stupid bike lanes. We have one of the best public transportation systems in the world. Let people take the subway or bus and walk. The project is an outgrowth of the agency's outreach for safer biking and walking access to the Harlem River bridges.